New photos from the Oct. 17 episode of DC’s Legends of Tomorrow have officially dropped. Teasing a log-line of “It’s always a circus” the CW teases that the episode, titled “Freakshow,” will find the Legends in 1870, where they gather to fix the anachronism which happens to be at P.T. Barnum’s fledgling circus. However, Nate (Nick Zano) and Ray (Brandon Routh) accidentally free a saber toothed tiger, creating a bigger problem. Meanwhile, P.T. Barnum (guest star Billy Zane) is on the hunt to capture Nate and Ray to make his show even more exciting for the crowd. Caity Lotz, Maisie Richardson-Sellers, Victor Garber, Dominic Purcell and Franz Drameh also star. Keith Tancharoen directed the episode written by Keto Shimizu & Grainne Godfree. It airs Tuesday, October 17 (9:00-10:00 p.m. ET) on the CW. Follow @ScreenSpy on Twitter | ScreenSpy on Facebook for more Legends of Tomorrow scoop this season. 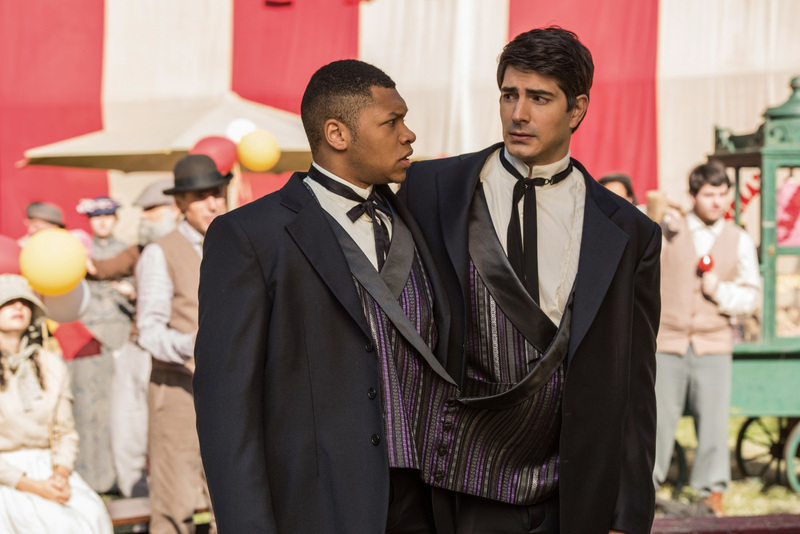 DC's Legends of Tomorrow -- "Freakshow" -- Image Number: LGN302a_0013.jpg -- Pictured (L-R): Franz Drameh as Jefferson "Jax" Jackson and Brandon Routh as Ray Palmer/Atom -- Photo: Dean Buscher/The CW -- ÃÂ© 2017 The CW Network, LLC. All Rights Reserved.